Let me begin by saying that I find Amazon’s new tactic of encouraging book buyers to visit local bookstores, use an Amazon app to compare prices, and then leave the bookstore to buy from Amazon – I find that abhorrent. That practice encourages people to not only forsake their local community members and economies but also tune into the worst parts of their nature by putting price above all other considerations as well as taking advantage of local stores’ merchandise and space to hurt the stores’ business. Horrible. Horrible. I have done my best to avoid business with Amazon for any number of reasons – mostly because I try very assiduously to support local bookstores. But right now, I am relying on Amazon in a big way, and this latest news makes me very conflicted about that. As many of you know, I’m using Kickstarter to raise funds for the research portion of my book. Kickstarter partners with Amazon business to track and collection contributions to their campaigns. Thus, I am supporting Amazon. I don’t like this. However, I am committed to my book project, and I really could use this funding. Thus, I find myself in the same situation many writers do – Amazon works for us – getting us sales and funding – even while, on a larger scale, it undercuts our work and our community. So many of us use Amazon reviews to boost our sales. So many of us send our buyers to Amazon because, sometimes, it’s the easiest (and occasionally) only online listing for a book. So many of us look to Amazon for things like the images of book covers and quick table of contents searches. So many of us use Audible.com for audio books. Amazon has made itself a useful – almost pervasive – tool. Thus, it will be difficult to do what I – and many others – are proposing we do. 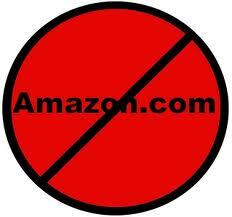 Boycott Amazon. As soon as my Kickstarter is over on Monday, my relationship with Amazon will cease. I will not set up the Audible account I had wanted to start. I will not use images from Amazon or link to reviews there. I will continue to buy my books elsewhere. The hardest part of this boycott for me will be the way it limits my ability to support my friends and other fellow writers. I won’t be writing reviews for their books there anymore; I’ll take my reviews to Powells instead. I really don’t like this, but I think it’s the only way. So I ask you to consider joining me in this boycott, if you feel so led. It’s not an easy choice, by any means, but then, noting worth fighting for comes easy. I think our local bookstores and the living wages of writers are worth fighting for. What do you think of Amazon’s practices? How are they intertwined in your writing and reading life? What will you do with that relationship? If you would like to support my book project but would rather not do so through Amazon, please email me at andilit_at_gmail.com. I’m thinking through other methods as we speak. Thanks.